It is what the Pope did not say that should disturb the world. Also missing was the essential point that the Pope’s visit was made in a political environment in which Israel and the U.S. have once again insisted on their “two sides” recurring diplomatic dodge. Not so, by any standard of political realism. The prisoner is never equal to the jailer. founder of Palestinian liberation theology, a movement that for three decades has identified Palestinian occupation with Jesus’ suffering and response to injustice. Ateek’s 1989 book, Justice and Only Justice: A Palestinian Theology of Liberation, is the movement’s foundational work, and he runs the Sabeel Ecumenical Center in Jerusalem. As yet, no Papal prophetic reflection and no condemnation of occupation, has emerged. What we have, instead, is an invitation to Palestinian President Mahmoud Abbas and Israeli President Shimon Peres, to visit the Vatican where the Pope and the two leaders will pray for peace. When one says that “both” did not . . . make the “necessary hard decisions” . . . one consciously or unconsciously assumes that they are equal. Nothing is further from the truth. Israel is immeasurably stronger than Palestine in every material respect. One resembles a sleek American skyscraper, the other a dilapidated wooden shack. Palestine is under occupation by the other half of “both”. Palestinians are totally deprived of all elementary human and civil rights. Average income in Israel is 20 times higher than in Palestine. Not 20%, but a staggering 2000%. Militarily, Israel is a regional power, and in some respects a world power. In this reality, speaking of “both” is at best ignorant, at worst cynical. Anyone who uses the term, “both sides”, is saying there is only one version of reality, the Israeli version. The Pope was on his three day trip to the Holy Land, his first as a pope, when Israeli soldiers shot and killed two Palestinian teen-agers on May 15, 17-year-old Nadim Siam Nuwara and 16-year-old Muhammad Abu al-Thahir. The Pope is most certainly aware of the deaths of these two teen-agers, both of whom were shot near the Ofer military prison in the West Bank on the 66th anniversary of the Nakba. Parents of the two young boys appealed directly to the Pope to “speak out against their murders and to watch video footage of the killings”. “We appeal to Your Holiness as a religious and spiritual leader to call on international human rights organizations to seek justice in the prosecution of the perpetrators and hold their leaders accountable for the murder of our sons,” the parents say in a message issued through Defence for Children International-Palestine Section (DCI-Palestine). “Our hearts are torn in anguish for the loss of our sons, whose young lives, dreams, and hopes were cut short by the bullets that struck them…they were murdered with the utmost cruelty and disregard for human life, at a time when our people were recalling the tragedy of the Nakba that befell upon us at the hands of the Israeli occupation. The murders of the two teen-agers did not occur in darkness, away from the prying eyes of television eyes of modern media. Instead they took place in daylight. A security camera, and an alert CNN cameraman. were there to film their deaths. As this report by Ivan Watson shows, CNN’s cameras were apparently trained on the Israeli occupation soldier who shot one of the boys. CNN adds a warning to viewers that the video may be disturbing to some viewers. It is indeed, disturbing. What matters now is how Israel will react to the charge that the deaths of the two teenagers could not be blamed on them because they only used rubber bullets. Both teen-agers were killed with live ammunition. As the video footage from CNN and from Israel’s Ha’aretz, indicate, they posed no threat to the Israeli soldier or soldiers who shot them. 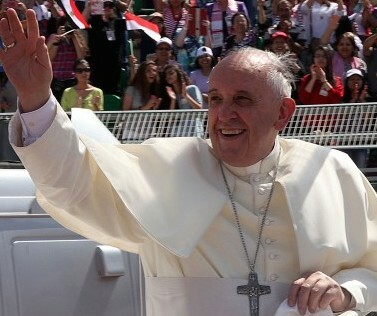 How will Pope Francis respond to the letter from the Abu al-Thahir and Nuwara families? What will he say to them and to the thousands of other Palestinian families whose children have been imprisoned, tortured, beaten and killed in the name of a false “both sides” peace talk charade? Those upcoming Vatican prayers involving the Pope and his Israeli and Palestinian guests, are not without merit. It is neither presumptuous nor unreasonable to hope that the Pope will include in his prayer the names of two Palestinian teen-agers, 17-year-old Nadim Siam Nuwara and 16-year-old Muhammad Abu al-Thahir, both shot to death on the 66th anniversary of the Nakba. The picture of the Pope above is from the Turkish World Bulletin. The video is from CNN by way of the Electronic Intifada. This entry was posted in Middle East, Middle East Politics, Obama, Television. Bookmark the permalink. A great deal of the continuing Nakba is in your opening lines. “Palestine is the story out of sight” could be a title. Some Jewish and Palestinian writers have attempted to tell “the missing history,” but their voices have largely gone unheard. The blind and the deaf leading the people (claiming “both sides”) lead to more blindness and more more deafness. The pope did not talk about the Israeli attack on the U. S. S. Liberty either, nor did he mention the legislation pending in the Senate to repeal the War Powers Resolution of 1973, and to vest in Netanyahu the power of committing the United States to war in support of Israel if he decides to attack Iran. Francis could not say more, — for diplomacy is a matter of nuance and innuendo. Yet Francis acknowledged the state of Palestine against Israeli wishes, and offered mediation which has been accepted by both sides. No world leader has thus far done more. And as John Paul II admonished the United States and Great Britain against an invasion of Iraq, Francis mobilized world opinion against an Americian intervention in Syria. And for that matter Benedict XV backed the Christmas truce of 1914, and launched an initiative to end the First World War on the principle of peace without victory which Woodrow Wilson rejected before he endorsed the corrupt diplomacy of 1919 that made the Second World War inevitable. The foundation of the trouble in the Middle East is that the United States has not returned to a peace footing since the conclusion of the Cold War, and has continued unwavering support of the Likud faction in Israel, which does not speak for American Jews or Christian Zionists in the United States. — John Remington Graham of the Minnesota Bar (#3664X) . This blog post expresses the views of those who expected that the pilgrimage of Pope Francis in the (not so) holy land would turn into an over political event, which Francis said he will not do. Yes, many of us would have been glad if he said more, and if he mentioned the occupation. However, we have to admit that the little that he did do was able to obviously upset enough Israeli authorities. More important than that, however, is what is coming next on this matter. And I think Pope Francis still has a few surprises for us in his sleeve. We shall see.